This section of Obscure Finds Numismatic Collection is made up of coins from the Canada region and specializes in 1967 Canadian Confederation Silver Dollar coins from coin category One Dollar	. If you are looking for coin facts, numismatic data or simple melt value composition of the Canada - 1967 Canadian Confederation Silver Dollar coin, you can find it here at Obscure Finds. The Royal Canadian Mint issued the first silver dollar in 1935 to commemorate the Silver Jubilee of King George V. For the 100th Anniversary of Canada the 1967 Canadian Confederation Silver Dollar was issued. 1967 marked the end of the silver dollar as a business strike, or a coin issued for circulation. After 1967, the dollar coin was made of nickel, except for non-circulating commemorative issues for the collector market, which continue to contain silver. 3 major varieties of the 1967 Canadian Confederation Silver Dollar. The goose's normal level position is completly horizontal when the queen's head is pointing to 12 o'clock. 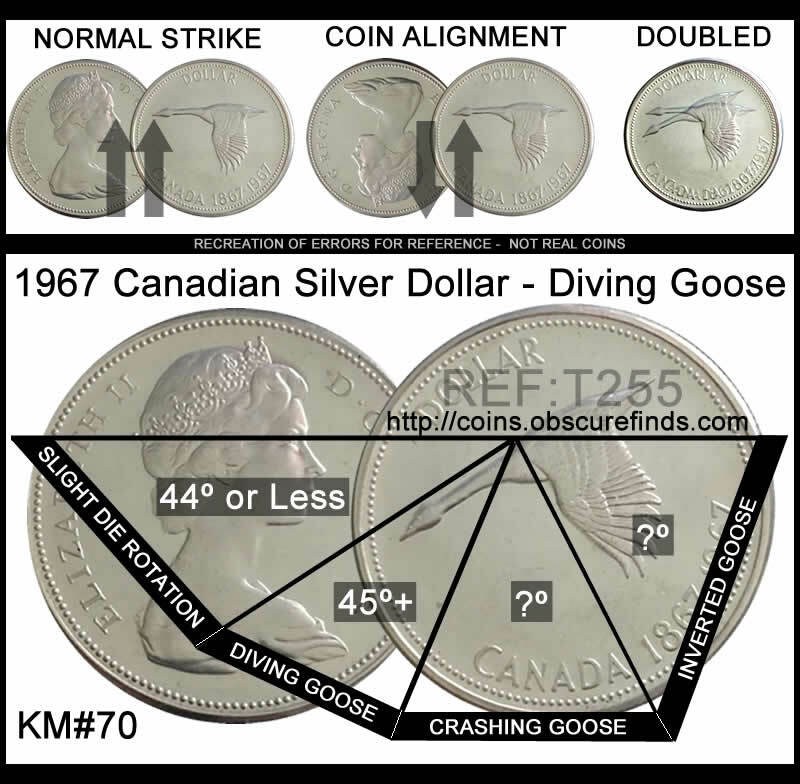 The angle of the goose seems to be the important part here, ranging from slight die rotations of (0º-44º) on to (45º+) where the goose is considered to be diving, crashing or even an inverted flight goose. The Canadian Centennial was a yearlong celebration held in 1967 when Canada celebrated the 100th anniversary of the Canadian Confederation. Celebrations occurred throughout the year but culminated on Dominion Day, July 1. 1967 coins were different from previous (or forthcoming) years' issues, with animals on each — the cent, for instance, had a dove on its reverse. The Centennial Flame was also added to Parliament Hill. A Centennial Train traversed the country and school children across the country were able to see exhibits raising their consciousness as to Canadian history and nationalism and enlivening their enthusiasm to visit Expo. The cent coins had a dove with wings spread. The nickel coins had a snowshoe rabbit bounding left. The dime coins had an Atlantic mackeral facing left. The quarter coins had a lynx striding left. The half dollar coins had a seated wolf howling. The dollar coins had a goose flying left. In 1867 without firing a single shot (or drop of blood Canada) received its independence and became a Commonwealth Nation within the British Empire and establishing itself as a Confederacy.